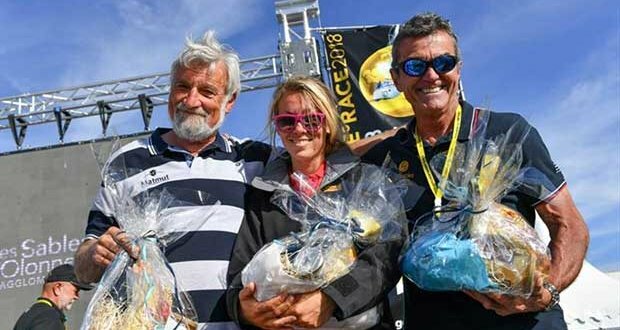 With five days to the start, the Golden Globe Race Village in Les Sables d’Olonne is buzzing with activity as 18 skippers and their teams from 13 countries work feverishly to be ready for the Noon start on Sunday. The skipper with the biggest mountain to climb is Italian Francesco Cappelletti who’s Endurance 35 007 arrived by road only last Friday. She’s been launched and rigged since, but her completion is far from complete and Capelletti has still to make three days of solo sea trials in her. Fifty years ago fellow Italian Alex Carozo, one of the nine starters in the original Sunday Times Golden Globe Race faced a similar problem with his boat and sat on a mooring in isolation for five days after the start deadline, completing his preparations. Carozo, now 86, arrives in town on Thursday and will undoubtedly be rolling up his shirtsleeves to help. But Cappelletti has help aplenty. Six apprentices from the local Tabarly professional boatbuilding college have already volunteered their services and other locals are providing moral support. It is time that is not on Cappelletti’s side. All competitors have until Noon on Friday to pass their safety inspections or they miss Sunday’s start. Nabil Amra, the Palestinian/American sailing the Biscay 36 Liberty II is also racing against time. He is due to return to Les Sables d’Olonne tomorrow having completed the final part of his solo sailing trials only to return to sea again to do his 5 mile jury rudder trial. The problem he has is that his emergency rudder, which forms part of the self steering gear, is not due to be delivered until Friday morning – just hours before the Noon safety deadline set by the French authorities. Mark Slats (NED) Rustler 36 Ohpen Maverick and Philippe Péché (FRA) Rustler 36 PRB have been given weight penalties in the form of an extra main battery for modifications made to the standard specifications allowed to their boats. This week, the GGR village has been swelled with 11 French classic wooden yachts and two of Eric Tabarly’s famous yachts, Pen Duick II in which he won the 1964 OSTAR transatlantic race, and the maxi sized Pen Duick VI in which he competed in the 1977/8 Whitbread round the world race. 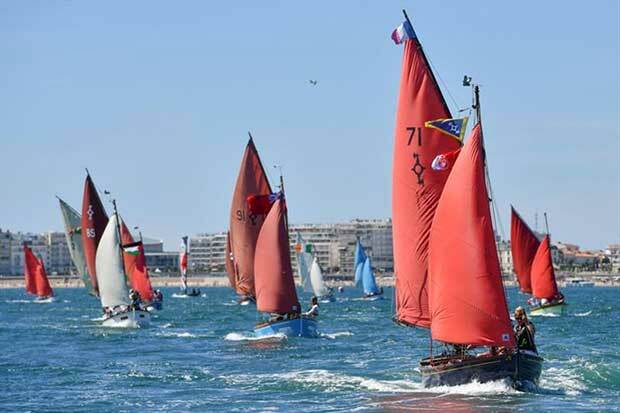 Gipsy Moth IV, the yacht that Sir Francis Chichester sailed solo around the world with one stop in Sydney, Australia, a feat that led to the first Golden Globe Race in 1968/9, is expected to arrive in Les Sables d’Olonne on Thursday 28th June. She will join Suhaili and Joshua, the yachts that Sir Robin Knox-Johnston and Bernard Moitessier sailed in the original Golden Globe Race, on public display on the GGR pontoon within the Race Village. And finally, Abhilash Tomy (IND) has found himself embroiled in the strange case of the prodigal barometer ‘borrowed’ from the Chain Locker pub in Falmouth within hours of Sir Robin Knox-Johnston presenting it to the hostelry, 50 years after he too had ‘borrowed’ it for his solo non-stop circumnavigation. It transpires that the distinctive ‘Lovely Day for a Guinness’ branded weather indicator was lifted from the wall of the pub early the following morning by Don McIntyre, the GGR Race Founder, who then smuggled it on to Tomy’s Suhaili replica yacht Thuriya before she sailed for France.